Crafty Texas Girls: Weekend Project: Cook with Dad! I am relaxing with my family this week. 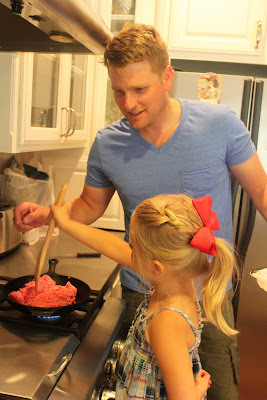 So here is a fun activity to get your kiddos and hubby cooking together. It was originally published on SouthlakeMoms. 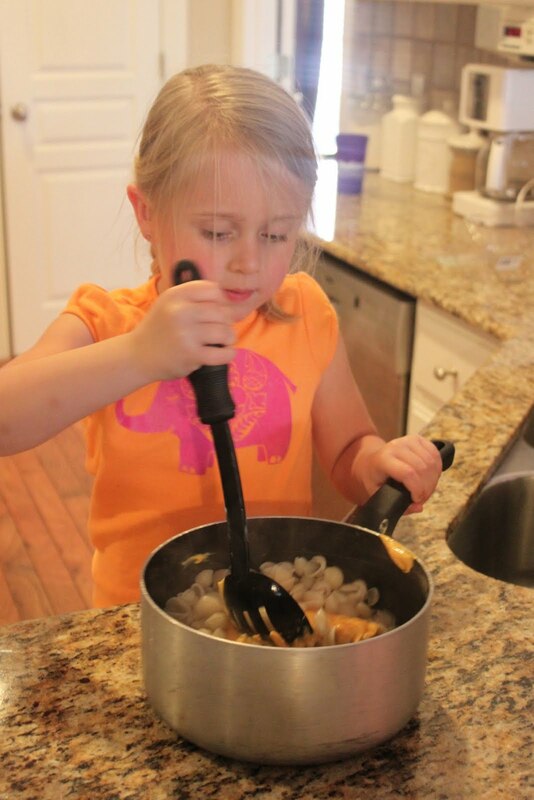 One of my daughter's favorite "special activities" is getting to help with the cooking. And in our family, my husband is actually the one who does most of the meal preparation. Now I am the baker, but since our family cannot live on cake and cookies alone, I am glad that my hubby enjoys spending time in the kitchen. So when thinking about how we will spend Father's Day this year, the first thing that popped into my mind was of course the food. And what better way to spend some quality time with Dad than working on a project together? 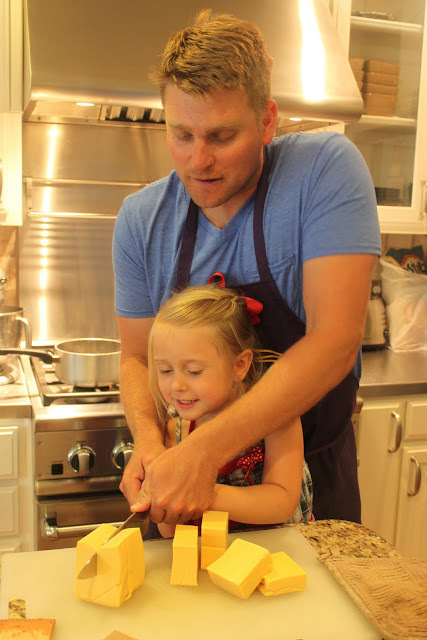 Cooking is the perfect, fun and simple activity that both Dad and the kiddos will enjoy. Even if your husband's idea of creating a 'home-made-meal' means ordering pizza, this will be fun! Getting your kiddos in the kitchen gives them a chance to work on basic measuring, experience real-world application of math skills, and create something they can be proud of. My daughter is always more willing to try a dish if she has had a hand in preparing it. Plus it is always easier to talk and laugh when food is involved. 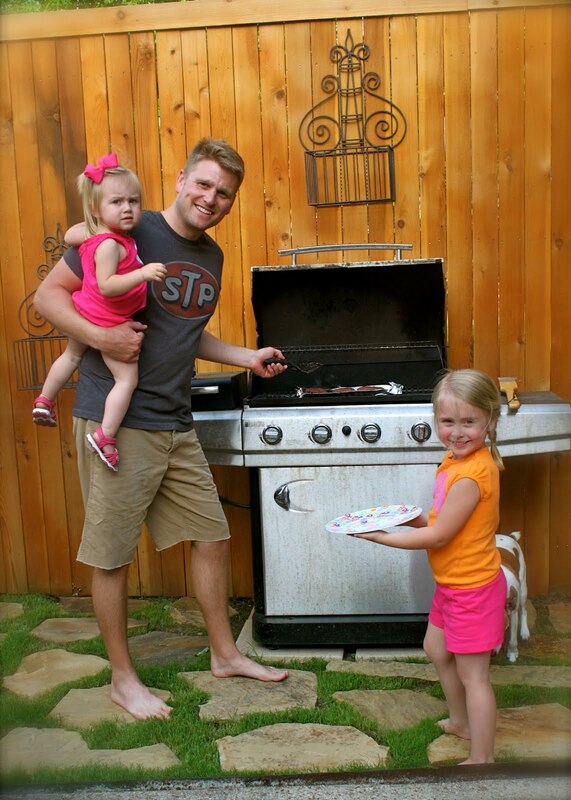 You can use any recipe for Dad and the kiddos to put together. But think about simplicity, ease and 'talent' of the chefs involved. Keep it simple and yummy! Since we will be grilling out and swimming with family for our Father's Day, munchy-appetizers are a must for the menu. My daughter is 5 years old and her pick for their recipe... Daddy's famous "Texas Queso". Whether your husband is a novice or a professionally trained foodie, everyone can appreciate a good queso. Remember, this a time for Dad and the kiddos to have fun in the kitchen. And since it is his day, don't worry about the mess! Take into consideration the age of your kiddos before handing over a knife or working around a hot stove. Parental supervision and guidance is needed. First, Dad removed almost all the seeds from the peppers. Don't forget, the more seeds the hotter the queso. One of our friends gave us this nifty 'pepper corer' a few years ago, but it can be done easily with a knife as well. Next the peppers are boiled for 5 minutes. Reserve 2/3 cups of the 'jalapeno water' to use later in the recipe. The peppers are then diced and set aside. Brown the ground beef in a skillet. My daughter loved this step, because she enjoys 'seasoning her food'. Sprinkle on salt, pepper, chili pepper and a bit of olive oil for flavor. Then cube 2 pounds of Velveeta cheese. This is a good opportunity to work on cutting skills with the kiddos. Just make sure to mind those fingers. Finally combine the one can of Rotel, diced peppers, 2/3 cup of jalapeno water, ground beef, cubed Velveeta, and 8 ounces of cream cheese. Mix it all together and then let it simmer on low for 2 hours before serving with tortilla chips. "Texas Queso" is creamy and flavorful. Depending on the amount of seeds you leave in your jalepanos, it is also mild enough to be enjoyed by all ages. Help your kids show Dad how much they love him this year with some fun in the kitchen Children grow up too fast. The gift of time together is valuable and the memory of happy times is something your family will always treasure.